More than 130,000 comic book fans are expected to make the trek to San Diego later this week for Comic-Con -- a massive convention celebrating all things related to comics books. But in this digital age, fans can now get their "superhero fix" in more ways than ever before. Flipping through the pages of your favorite comic book isn't what it used to be -- music and sound effects are now part of the story. Marvel Comics, the industry's leading publisher, now offers readers the ability to put tens of thousands of comics at their fingertips, using a streaming app for tablets or smartphones. 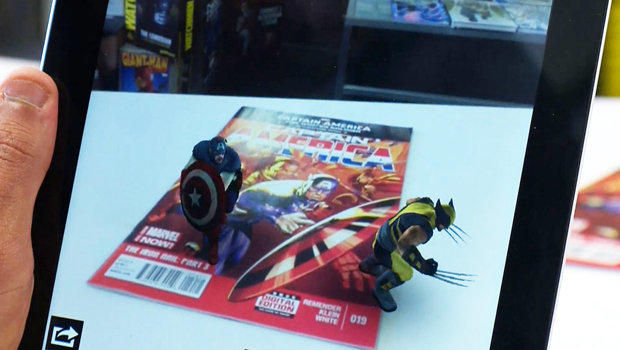 "We view it as the new, newsstand to find new fans," said Axel Alonso, editor-in chief for Marvel Comics. "By moving into the digital arena, is to take advantage of the technology and tools to continue telling a comic book story...just on a different platform." Alonso says the digital push is not threatening the print business -- it's boosting it. Nationally, comic books sales are expected to bring in $800 million dollars this year, that is up from nearly $700 million in 2011, according to the market research firm IBISWorld. Digital comics are taking off, too, with sales up 260 percent over just the last three years, according to ICv2. Marvel is feeding fans' appetite for comics with an unlimited digital subscription for phones or tablets. "It's very important that we honor our tradition and, in doing so, our long-term fans, but also have an eye on the future to make sure we are always up with the times," Alonso said. Marvel's newest endeavor is in Augmented Reality. With a free app, users can place their smart device over certain Marvel comic books to instantly unlock digital extras, like video of their favorite comic heroes in action. Marvel's rivals at DC Comics are also embracing the latest technology with 14,000 of their own digital comic books, which readers can download for a fee. Marvel and DC Comics are the two major players in the industry, accounting for about 62 percent of the comic book market, according IBISWorld. "The thing about digital comics is that they are super portable, so you kind of always have access to your library," said Jim Lee, DC Comics co-publisher. "But there's something very charming about the print books themselves and...people collect them." In the battle for readers, Jim and his fellow co-publisher Dan DiDio believe 'print' and 'digital' are a dynamic duo. "The digital's actually drive people to the collected additions," DiDio said. "It almost becomes a sampler in some ways. They get a taste of the characters, but once they have it, they want to hold the book, they want to put it on a bookshelf."